What’s the best putter face to help you hole more? 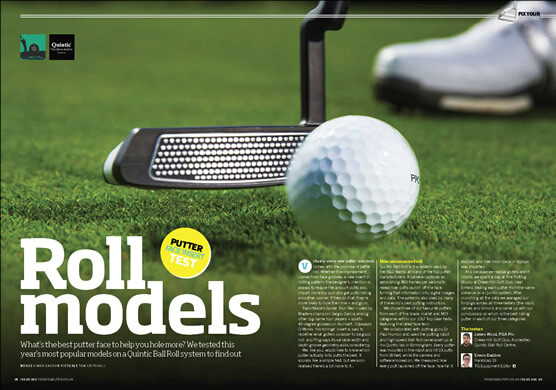 We tested this year’s most popular models on a Quintic Ball Roll system to find out. Virtually every new putter launched comes with the promise of better roll. Whether the improvement comes from face grooves, a new insert or milling pattern, the designer’s intention is always to reduce the amount putts skid, impart more top spin and get putts rolling smoother, sooner. If they do that, they’re more likely to hole their line – and go in. To read the full article, please click here or on the image below. When it comes to putting, everyone thinks they’re an expert. At least once, we have all been told what we were doing wrong on the putting green and how we SHOULD fix it. We see this universally — most golfers want to help other golfers get better. But are they really helping, and is the information they’re sharing accurate? 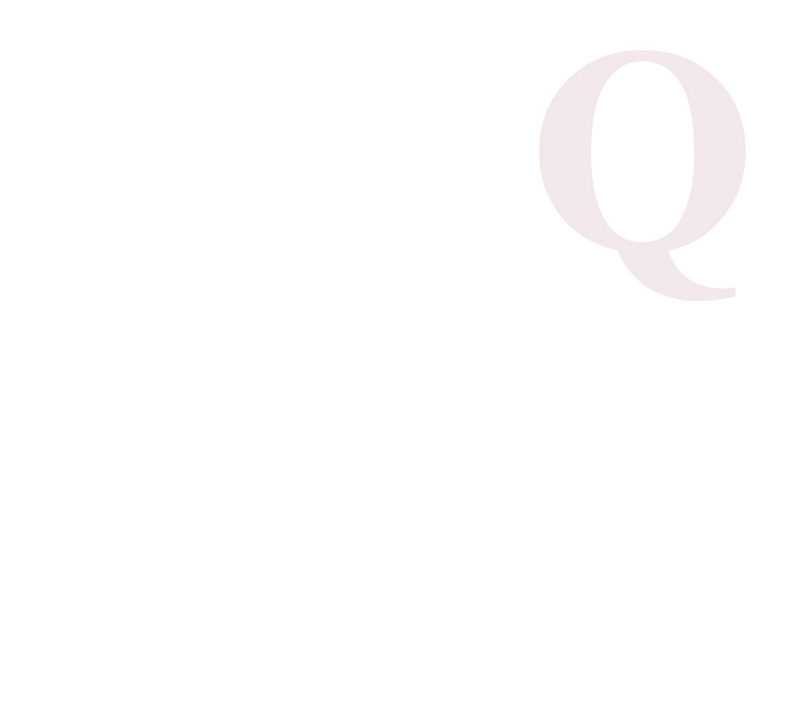 The truth is, without quantifying the given information, the answer is usually no. A system we use at Modern Golf called Quintic Ball Roll provides these answers by accurately measuring the interaction between the clubhead and ball. By doing so, a golfer can identify why they have certain habits. More importantly, they’ll know how to make the proper changes. Tangible results are the key to helping golfers with their putting technique and thus, the study of ball dynamics is here to stay. "I first got interested in putting at university, using high-speed cinematography (no fancy cameras back then!) looking at impact with drivers and ball. I also looked at wedges and putters... it amazed me how little time the golf ball is in contact with the putter - 0.000125 seconds (filmed at 20,000 frames per second). Believe it or not, this is much less than a driver, which is more like 0.001s..."
"For what seems to the outside world like a very simple task, it is vastly underestimated the amount of science that is involved within putting; how the club face and ball interact is amazing to see and analyse." "Purists call them ugly; designers call them progressive. Either way, extravagant putter designs are here to stay. 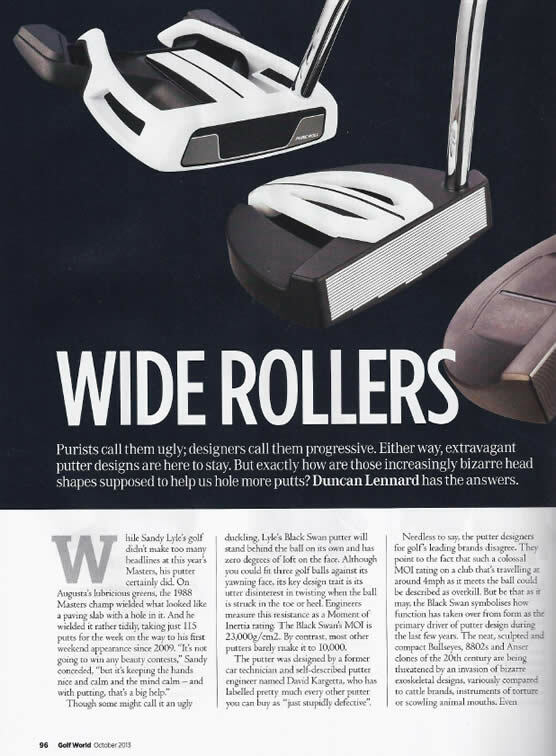 But exactly how are those increasingly bizarre head shapes supposed to help us hole more putts? Duncan Lennard has the answers." If you thought that launch angles and spin rates were the sole territory of woods and irons, then think again. Even when it comes to the humble putter, faults and fixes become clear when dipping into the world of science and technology. 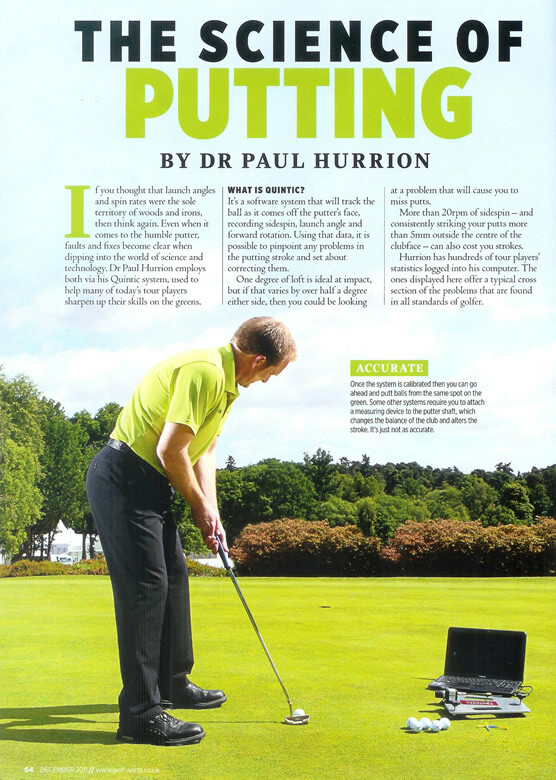 Dr Paul Hurrion employs both via his Quintic system, used to help many of today's tour players sharpen up their skills on the greens. Following last month's putting instruction featuring Dr Paul Hurrion's work with Rory McIlroy, we focus on how the same coach's Quintic Ball Roll putting analysis system is now guiding regular golfers - as well as tour stars - to the correct specifications and stroke. 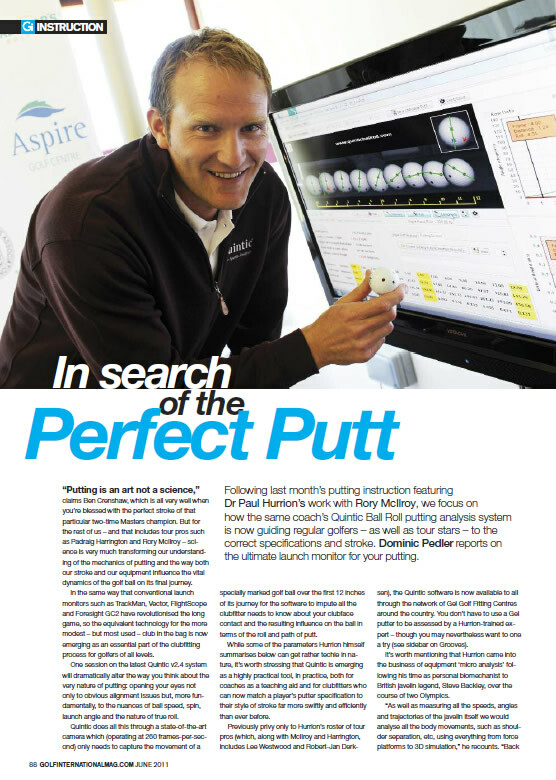 Dominic Pedler reports on the ultimate launch monitor for your putting. "Putting is an art not a science," claims Ben Crenshaw, which is all very well when you're blessed with the perfect stroke of that particular two-time Masters champion. But for the rest of us - and that includes tour pros such as Padraig Harrington and Rory McIlroy - science is very much transforming our understanding of the mechanics of putting and the way both our stroke and our equipment influence the vital dynamics of the golf ball on its final journey. In the same way that conventional launch monitors such as TrackMan, Vector, FlightScope and Foresight GC2 have revolutionised the long game, so the equivalent technology for the more modest - but most used - club in the bag is now emerging as an essential part of the clubfitting process for golfers of all levels. One session on the latest Quintic v2.4 system will dramatically alter the way you think about the very nature of putting: opening your eyes not only to obvious alignment issues but, more fundamentally, to the nuances of ball speed, spin, launch angle and the nature of true roll. Quintic does all this through a state-of-the-art camera which (operating at 260 frames-per-second) only needs to capture the movement of a specially marked golf ball over the first 12 inches of its journey for the software to impute all the clubfitter needs to know about your clubface contact and the resulting influence on the ball in terms of the roll and path of putt. While some of the parameters Hurrion himself summarises below can get rather techie in nature, it's worth stressing that Quintic is emerging as a highly practical tool, in practice, both for coaches as a teaching aid and for clubfitters who can now match a player's putter specification to their style of stroke far more swiftly and efficiently than ever before. Following Gi's visit to The Belfry to see the system in action, here is Hurrion's instant guide to the putting parameters that the Quintic v2.4 measures and why they matter so much to your own putting game. 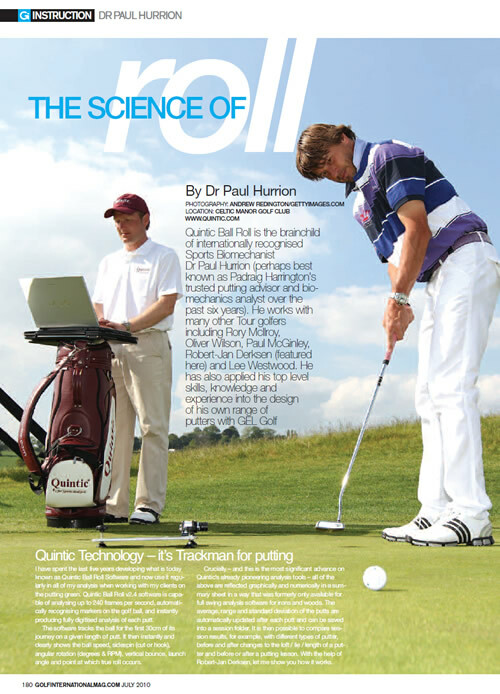 Quintic Ball Roll is the brainchild of internationally recognised Sports Biomechanist Dr Paul Hurrion (perhaps best known as Padraig Harrington's trusted putting advisor and biomechanics analyst over the past six years). He works with many other Tour golfers including Rory McIlroy, Oliver Wilson, Paul McGinley, Robert-Jan Derksen (featured here) and Lee Westwood. He has also applied his top level skills, knowledge and experience into the design of his own range of putters with GEL Golf. I have spent the last five years developing what is today known as Quintic Ball Roll Software and now use it regularly in all of my analysis when working with my clients on the putting green. Quintic Ball Roll v2.4 software is capable of analysing up to 260 frames per second, automatically recognising markers on the golf ball, and instantly producing fully digitised analysis of each putt. 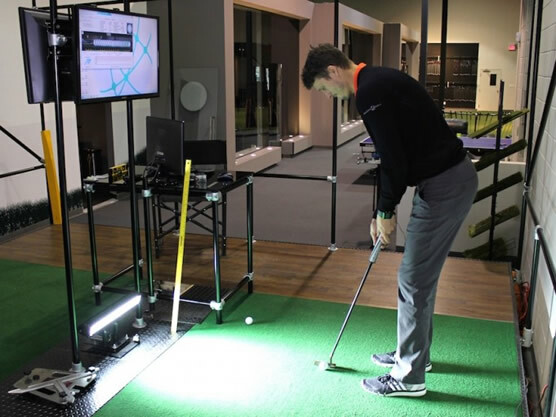 The software tracks the ball for the first 30cm of its journey on a given length of putt. It then instantly and clearly shows the ball speed, sidespin (cut or hook), angular rotation (degrees & RPM), vertical bounce, launch angle and point at which true roll occurs. Crucially - and this is the most significant advance on Quintic's already pioneering analysis tools - all of the above are reflected graphically and numerically in a summary sheet in a way that was formerly only available for full swing analysis software for irons and woods. The average, range and standard deviation of the putts are automatically updated after each putt and can be saved into a session folder. It is then possible to compare session results, for example, with different types of putter, before and after changes to the loft / lie / length of a putter and before or after a putting lesson. With the help of Robert-Jan Derksen, let me show you how it works. Out of one of the foremost biomechanics software laboratories comes a world first. The New Quintic Ball Roll System gives putting coaches and putter custom-fit professionals the kind of analysis tool they’ve never had before. What it means is that golfers need never be uncertain of the performance of their putters again. The Quintic Ball Roll software tracks the ball for the first 12″ of the putt. It then instantly and clearly shows the ball speed, sidespin, angular rotation, vertical bounce, launch angle and point at which true roll occurs. Crucially as well – and this is the most significant advance on Quintic’s already pioneering analysis tools – all of the above are reflected graphically and numerically in a way that was formerly only available for full swing analysis software for irons and woods. Putter manufacturers can use this tool to test their equipment, design better putters, and as a sales tool to show the golf professionals how to increase putter sales over the counter. The over-the-counter part is key. Pros who make a living out of retail and coaching have been victims of “web-watch-time-wasters” for too long. This is the practice whereby customers waste a pro’s time by trying out equipment in the shop and then sourcing the cheapest price on the internet. Golf professionals will be able to more accurately fit their customers for a putter, give better coaching and sell more putters as part of a demonstrable package. 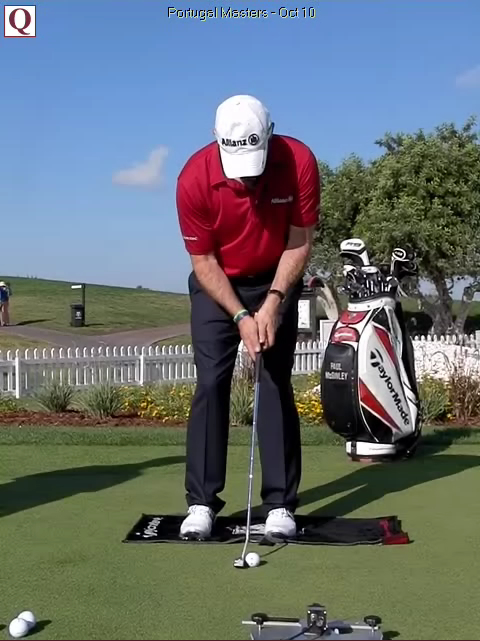 Golfers themselves can all benefit from using the system because they will be getting facts to back up their decision on which putter is performing best and see if any alterations need to be made to fine-tune the putter to their stroke.